Before long, Memorial Day Weekend 2014 will be upon us. 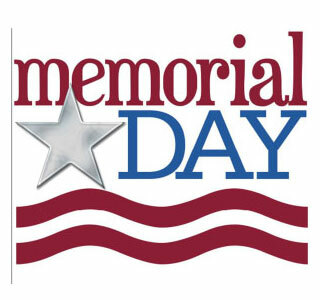 Understandably, many Americans will be celebrating all weekend long with family and friends. If you are hoping to hold Memorial Day Weekend festivities of your own, its best to order your party tents, tables and chairs now. Otherwise, you may find yourself celebrating without appropriate shelter and seating. At Canopies and Tarps, we have party tents suitable for casual, formal, private and public affairs of all sizes. Some of them, like the 1 5/8 x 18 x 20 Commercial Duty Party Tent, are completely enclosed and feature windows. Others, like the 20 x 20 x 2 Decorative Party Tent, are designed to be wide open on all sides. Because there are so many party tents presently on offer, determining which one is right for your Memorial Day Weekend event will require a bit of planning. Start by thinking about how you want to incorporate the party tent into your Memorial Day Weekend celebration. For example, do you want to use a cocktail party layout or some other option? What about tables, chairs, dance floors and stages? Do you plan on using them too? If so, youll need to calculate how much square footage is required to comfortably accommodate all of those elements. One of the easiest ways to do that is to invest in a CAD program. Simply program all of the elements you plan on using into the software and create a Memorial Day Weekend party layout. Then use the results to calculate which size party tent would work best with your design. Of course if you didn’t want to invest in a CAD program, you could always create a party layout by hand and figure out the calculations on your own. To learn more about choosing the right party tents for Memorial Day Weekend events, please contact us at (877) 811-3911. Our party tent experts are always willing to help event planners determine which products will deliver the best results for any special get-together’s. This entry was posted in party tent and tagged party canopies, party tents on April 25, 2014 by CanopiesAnd Tarps. Now that the weather has turned warm, have you tuned up your four-wheeler or ATV yet? If not, its time to get busy and take care of all of the outdoor recreation essentials. Wed suggest starting with canopy top replacements. Canopy top replacements may help protect your four-wheeler or ATV from the elements. And we all know how crucial that is. Dirt can get into inopportune places and cause everything from clogged air and fuel filters to damaged cylinders and episodes of overheating. Plus, the suns UV rays can degrade the four-wheelers plastic, rubber and vinyl components. 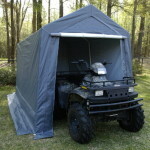 In addition to protecting your four-wheeler or ATV, canopy top replacements can protect you from the elements too. So completing routine maintenance tasks wont leave you feeling sunburned or wet and miserable. Speaking of routine maintenance tasks, dont forget to take care of them as soon as you’ve got your canopy top replacement in place. The list of routine four-wheeler and ATV maintenance tasks that generally need to be completed before the first run of the season is long but fairly simple to complete. It tends to include checking the coolant, oil and fuel levels as well as all of the four-wheelers working parts. In most instances, its also a good idea to wash the four-wheeler or ATV and apply any lubrication as needed. The good news is all of those activities may be completed from the comfort of your canopy covered carport. At Canopies and Tarps, we’ve got replacement carport covers and canopies that are suitable for use with a wide array of brands. ShelterLogic replacements are one of the most popular. As a ShelterLogic Authorized Dealer, we are intimately familiar with the companys products. So we can help you find the precise match for your existing carport, shed or portable garage. 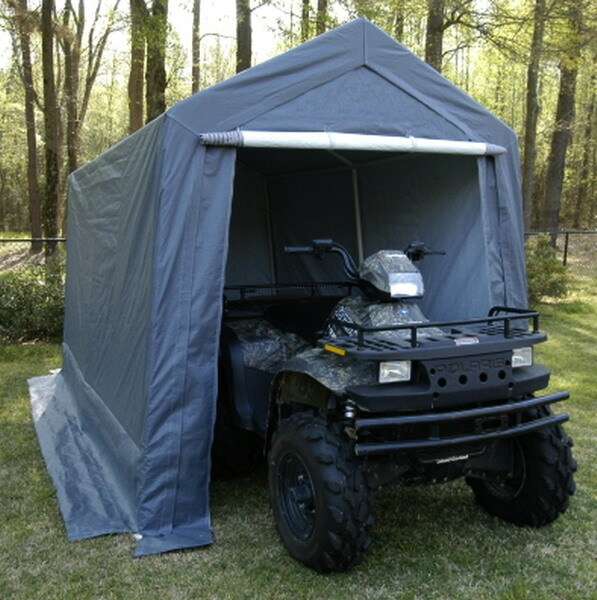 We can also help you pick out an entirely new shelter for your four-wheeler too. To learn more about the canopy top replacements and other storage solutions that we have in stock for off road enthusiasts, please contact us at (877) 811-3911. This entry was posted in replacement covers and tagged canopy tops, replacement covers, replacement tarps on April 25, 2014 by CanopiesAnd Tarps. When left exposed to the elements, pool water can pick up debris, evaporate and cool down. Thus, leaving the pool owner faced with ongoing cleaning, refilling and heating tasks. All of which can cost the pools owner priceless time and financial resources. Round poly tarps, on the other hand, are typically made with UV resistant, waterproof poly material. They tend to feature double lock stitched seams and rust resistant, modest-sized grommets. Placed evenly around the tarps exterior edging, the grommets are traditionally used to fasten the round tarps to grounded, guide wires or to the pools frame. Once the round tarps are in place, theyll help to keep windborne and vegetative debris out of the water. They are also capable of protecting the water from cooling winds and sun exposure. Prolonged sun exposure, as you may know, can lead to costly, evaporation related, water loss. It also is valuable to note that although the pool tarps come in various sizes, most are custom ordered. Thats why its best to order round poly tarps well before you decide to open up your outdoor pool for the season. That way, you wont have to leave the water unprotected. Using the round poly tarps throughout the season is a simple affair. Basically, the tarp is placed over top of the pool any time that it is not in use. Then its removed in minutes whenever anyone wants to take a dip. To learn more about round poly tarps for indoor and outdoor pools, pleasecontact usat Canopies and Tarps today. This entry was posted in Uncategorized on April 17, 2014 by CanopiesAnd Tarps. We all know that spring weather has a history of being unpredictable at best. It could be pouring down rain one minute and windy the next. So when moving from one job site to another, its important to protect your expensive tools from Mother Natures fury right? After all, no one wants to work with a rusty sawzall or hand tools. In our experience, one of the best ways to achieve maximum tool protection is to invest in waterproof, poly trucktarps. Poly truck tarps are traditionally manufactured out of reinforced, laminated, heavy-duty polyethylene. They sport a tear resistant, 14 x 14 cross weave and 12 mil. thickness. So theyll hold up no matter what man or Mother Nature dishes out. On top of that, each oil and UV resistant truck tarp is outfitted with beefy, metal D rings and evenly spaced, rust resistant grommets. The tie-down compatible grommets appear every 18 inches and the D-rings run in 2 foot intervals. Thus, fastening the abrasion resistant tarps to the truck in a secure fashion will be a cake walk. Once securely attached to the trucks, the tarps will definitely help to keep tools and other cargo safe from the elements. To protect them from potential, transient shifting damage too, consider pairing the poly truck tarps with cargo netting, bed liners and bed mounted tool boxes. You can find those three items at most major truck retailers. As for the poly truck tarps, youll find a wide assortment of them on offer at Canopies and Tarps. The tarps range in size from 07 x 09 to 11 x 24. Each one comes in basic black, which will help to hide the appearance of everyday road dust and organic debris. To learn more about them and secure a few before your next construction job begins, pleasecontact usat (877) 811-3911. When you do, be sure to inquire about our welding blankets, grinding curtains, machine covers and roofers tear-off tarps too. Because liners are an essential part of water gardens and containment ponds, wed suggest ordering them at least two to three weeks in advance of the scheduled clean out. That way, if the pond liner does appear to need replacing, you wont be waiting on the delivery man to arrive.In addition to replacement pond liners, youll want to have other clean out supplies on hand too. Wed recommend having an assortment of scrub brushes, buckets, holding tanks, scoops, rakes and a garden hose. Depending on the size of the pond or garden, a clean-out pump may also prove to be helpful. Once you have your supplies, use the buckets, rakes and scoops to remove the water and surface debris. Any viable aquatic life should be removed too. They may be temporarily placed inside of holding tanks. When you finally reach the pond liner, carefully clean and hose off it off as well. Any residual water and cleaning residue should also be removed at this time.While youre doing so, examine the pond liners surface for signs of weak spots, holes, tears and other imperfections. If you find any, go ahead and replace the entire pond liner with one of ours. Our polyethylene pond liners are extremely durable. So the likelihood that youll end up with leaks and other problems in between clean outs is extremely low. After that, clean your ponds filters and start replacing the water. Then check the waters purity and temperature and make adjustments as needed. When everything seems to be back in pristine order, go ahead and return the ponds flora and fauna back to their respective homes. To learn more about pond clean outs and pond liners, pleasecontact usat (877) 811-3911. Wed love to share what we know about ponds and help you choose the right liners for your home or business. This entry was posted in pond liners and tagged pond liners on April 10, 2014 by CanopiesAnd Tarps. By all accounts, many of Americas farmers are going to be faced with forage shortages in the coming months. If you feel that you are going to be one of them, nows the time to take decisive action. In our opinion, investing inhay coversand planting fast-growing, warm weather crops is the best way to proceed at the moment. Five warm weather plants that tend to provide great emergency forage are teff, pearl millet, sundangrass, crab grass and sorghum-sundan grass hybrids. As long as the soil is in the 70 to 75 Degree Fahrenheitrange, you should be able to plant all five of them in the ground as early as May 1st. With that in mind, youll want to make sure that your propertys soil is fertilized and ready to go by then. Some of the forage crops, like the sorghum-sundan grass hybrids, can also be planted after May 1st and harvested several times throughout the summer months. However, it is important to note that the hybrids and regular sudangrass traditionally contain prussic acid. So youll want to use caution and expect some difficulties curing hay too. The list of forage crops that tend to contain low to no prussic acid includes pearl millet, crabgrass and teff. Once the warm weather crops are harvested, its advisable to protect them with high-quality hay covers. At Canopies and Tarps, we have side curtain covers, round and square hay covers in all different sizes. Each one is designed to be mold, water, sun, mildew and rot resistant. Thus, protecting your farms warm weather baleage should be no problem at all, no matter where you live. To learn more about protecting your warm weather forage supply with our hay covers, pleasecontact usat (877) 811-3911. The sooner you make contact with us, the quicker youll have your emergency forage plans well underway. This entry was posted in hay covers and tagged hay covers, hay tarps on April 10, 2014 by CanopiesAnd Tarps. Automotive logo pop-up tents offer car show, cruiser and swap meet enthusiasts a cool place to hang out in between events or sell their wares. They are also a phenomenal way to show off your love for a particular brand. 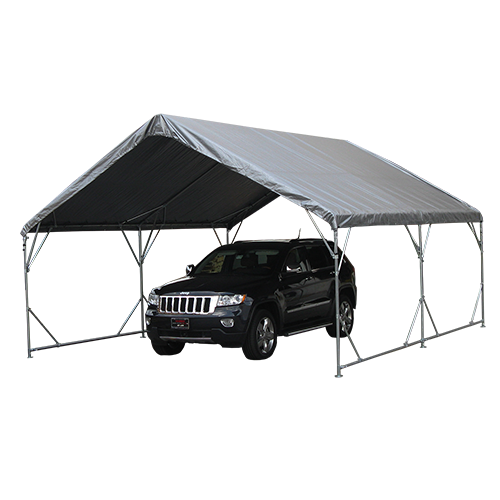 For example, at Canopies and Tarps, we currently have an array of 10 x 10 automotive pop-up tents in stock. The list of popular brands represented in our pop-up tent collection includes Ford, Chevy, Firestone, Hemi and Cadillac. In addition to looking about as hot as a muscle car hood scoop, our pop-up tents are a cinch to set-up. Thats because they are outfitted with pull-pin canopy releases. So you can spend less time wrestling with tent poles and more time drooling over duallys. Furthermore, the pop-up tents disassemble just as quickly as they set-up. As such, youll be ready to stow and go in no time too. Its also vital to note that the polyester fabric used to make the canopies is top notch as well. It is both water and UV resistant. Thus, the SoCal weather wont send you running for drier digs and bottles of sunscreen throughout the special events. It may, however, send those without automotive logo pop-up tents of their own scrambling to get underneath of yours. To learn more and grab some automotive logo pop-up tents in time for the next car show, please contact us at (877) 811-3911. And remember, we are happy to ship our pop-up tents nationwide. This entry was posted in pop up tents and tagged canopies, pop up canopies, pop up tents on April 3, 2014 by CanopiesAnd Tarps. If you have several vehicles and are concerned about one of your vehicles being exposed to the elements due to a lack of space in your garage for it to be safely parked inside, it can be a fantastic idea to purchase a canopy that is the proper size to provide the shade that you would like. Whether you need to buy a canopy that is the exact size of your vehicle so that it doesn’t take up a ton of space or you would prefer one of the larger canopies available, it makes sense to choose the design that best suits your home and personal preferences. In order for the canopy to provide the shade that it so important for preserving the condition of your car, it’s best to choose a canopy that is durable enough to prevent the sun from seeping in and causing further damage. Several of our canopies for sale offer enough protection so that your car isn’t being beaten down by constant sunlight day after day, helping to preserve the condition and value of your car. The large variation of sizes of canopies that we carry allow you to choose the option that works best for your home. 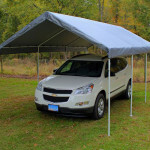 Since you need to have a canopy that is large enough for your car to park safely underneath and you likely don’t want it to take up too much space on the side of your home, it makes sense for you to take measurements where you intend on setting up the canopy. From valance styles to mesh tops, it’s best to consider the value of some of the canopies that are available. 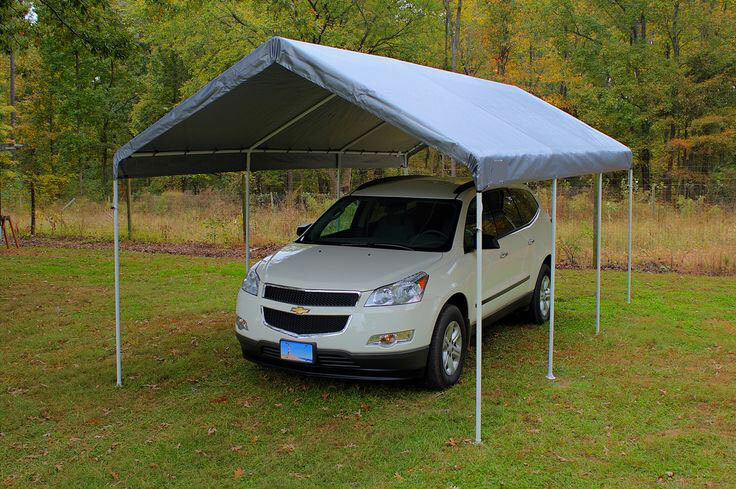 Whether you need the canopy to remain standing year after year with durability as your top concern or you need a cheap and temporary solution for your vehicle, it’s best to take a look at the different materials that are used for the canopies available. To discuss the variety of canopies that we sell and the best option for your needs, we invite you to contact us so that we can point you in the right direction. This entry was posted in canopies and tagged canopies, shelters, sun carprots on April 3, 2014 by CanopiesAnd Tarps.